One Nigeria forced on us by the British colonial empire has caused more harm than good without a single benefit. In 1967, Biafra Republic was declared by Ikemba Odumegwu Ojukwu and ever since then, the Nigerian government started killing Biafrans like "Christmas fowls" . Over 8.4 million Biafrans alone is assumed to have died in the hands of the Nigeria government since then till date and have not ceased to die in the cause for Biafra restoration. What will it look like if we allow the labour of these gallant warriors to be in vain? What then shall their innocent souls rejoice of if we fail to remember and honour them as our past heroes? Absolutely nothing! May 30th 2017, is another day upon which we shall be remembering our past heroes again, as we did on May 30th 2016; though this time, in another dimension and strategy which is to "SIT AT HOME". When we rallied in 2016 heroes day, the Nigeria military shot at random on us and killed many; both at Nkpor, Onitsha and Aba, simply to intimidate us and prevent us from honouring our heroes while theirs are being honoured. There is an Igbo adage which says that, "WHEN A BIRD LEARNS TO FLY WITHOUT PERCHING, HUNTERS WILL ALSO LEARN TO SHOOT WITHOUT TARGETING". If they have resolved to shoot at us during our rallies, we will give them another method which will be more damaging to them. In every part of Biafraland, people are to sit at home on May 30th, and business activities are to be locked down. Cars, tricycles, motorcycles and bicycles are not to be seen in motion. The Nigerian government thinks that they can hold us bounded, not knowing that we are always two steps ahead of them. This time, they will feel the heat from all nooks and cranny, because not only that they will not see whom to shoot at in the streets but also, it will have a very great negative impact in their dwindling economy as the major commercial cities in Biafraland; Onitsha Main Market Anambra State, Ariaria Main Market Aba Abia State and other sub main markets in Biafraland which serves as major sources of revenue to the Nigerian economy will be deserted on that day. Since Nigeria has decided to fight us, we must get ready for them and give them what is written in any chapter of inhumanity or the ruthless approach they open against us until we fight them to finish. Lets remain indoors, don't go to your businesses no matter the type of business you do, whether you are a sachet water hawker or a petty trader because they might see you on the streets or at your offices and shoot you to death cold bloodedly and carted away your goods and belongings. Buy everything you will need that day, a day or two days before the D - Day to enable you safeguard your lives properly from the hands of the Nigerian terrorists in military disguise, the soldiers. When we rallied in 2016, they tried to instigate fears into us by killing many; simply because they saw us rallying on the streets of Biafraland, and they were trying to make us desist from such idea of honouring our past heroes and heroines. 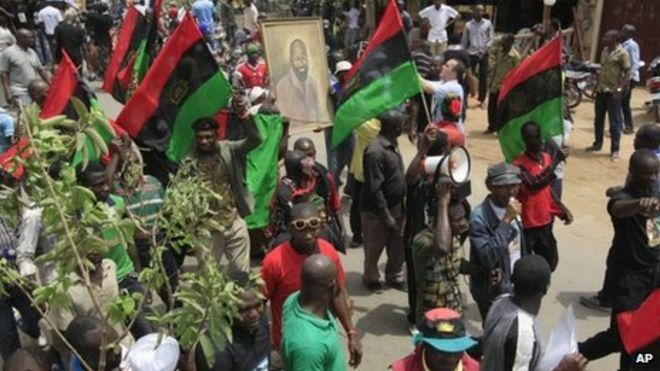 Since Nigeria do remember and honour their dead military men every January 15 which they placed from the initial July 6th as a result of the fact that Biafra soldiers surrendered on the 15th of January to the Nigeria soldiers, can anything stop the Biafrans from honouring their dead freedom fighters as well? Nothing can stop us, not even if Nigeria stops theirs. We must continue to remember our dead heroes and heroines as long as this struggle is concern; this is because as we observe and take care of the physical, so also we observe and take care of the spiritual. Our SIT AT HOME on May 30th remains sacrosanct, our past heroes must be honoured right there at the comfort of our homes. We need to remember our past heroes and heroines now more than ever.